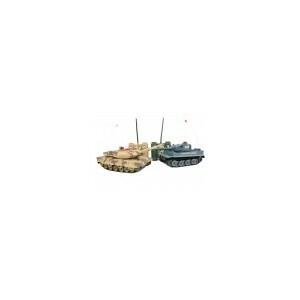 The Infra Red Battle Tanks set keeps the kids (and adults!) occupied for hours. The Tanks are radio-controlled with moving turrets and full control of movement. They will climb over cushions, books and other obstacles on the 'battlefield'. You can play stealthy hide and seek games or just slug it out in the open. When a tank is hit it loses a life and has slightly reduced ability until all 4 lives are used up and the tank dies! Be warned - it's very addictive!